See this link for videos, photographs and report. On August 12th we received a reply. We asked some of our signatories for some quick comments. We welcome other comments which will be published here after moderation. “The UK government has always claimed to raise human rights concerns in meetings with the Saudis, but these consequence-free “expressions of concern” are meaningless (and obviously disregarded by the regime). The line about Saudi being a conservative country is a standard one, and probably designed to appeal to Islamophobic and anti-Arab prejudice. The House of Saud is not a natural product of the traditions and society of the Arabian peninsula but a extreme and violent faction which conquered the country by force of arms less than 100 years ago. We cannot know for certain, given the total ban on political expression, but many Saudis are likely to be as appalled by Badawi’s treatment as we are. “It would be interesting to know why this letter was delayed – we didn’t receive it until the 12th August – peculiarly it doesn’t say when it was written other than ‘July’. Tory Foreign Minister Tobias Ellwood at the Parliamentary debate successively called for by the SNP’s Stewart MacDonald on July 21st, claimed the issue had been referred to the Saudi Supreme Court. But nothing was confirmed until the same day as we received the letter: August 12th. We obviously hope that the Supreme Court will release Raif Badawi and will go on to review and release Waleed Abu AlKhair as well as the hundreds and thousands of political prisoners. But we know that we may yet have a lot more work to do. Like millions across the world we are demanding that Raif be not flogged again but if he is we must take immediate action. Would you pledge to protest, if you can, on the day after such an event? We are proposing that as many people gather outside the Saudi Embassy in London We hope the threat of such action – will make the Saudi authorities aware of the outrage it will cause. For the moment we are gathering names and email addresses of those who will agree to attend. The protests will be in the afternoon to allow those from outside London to make it. If you would be prepared to consider joining our protest please fill in the online form from this link We will then email you with the details of such a protest. We presented our Open Letter with names of 930 human rights activists, politicians, writers, bloggers, journalists, lawyers, trade unionists and workers at 2pm. 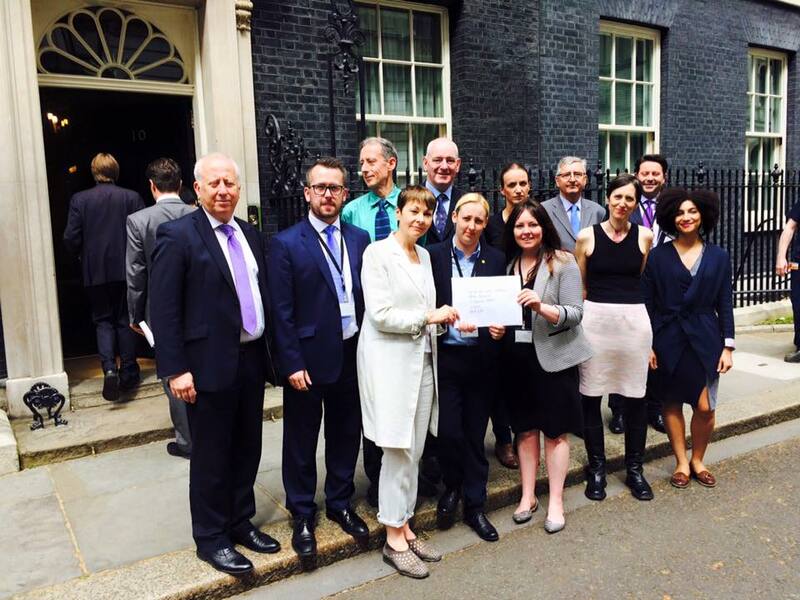 Thanks to all of the delegation who were allowed into Downing Street. 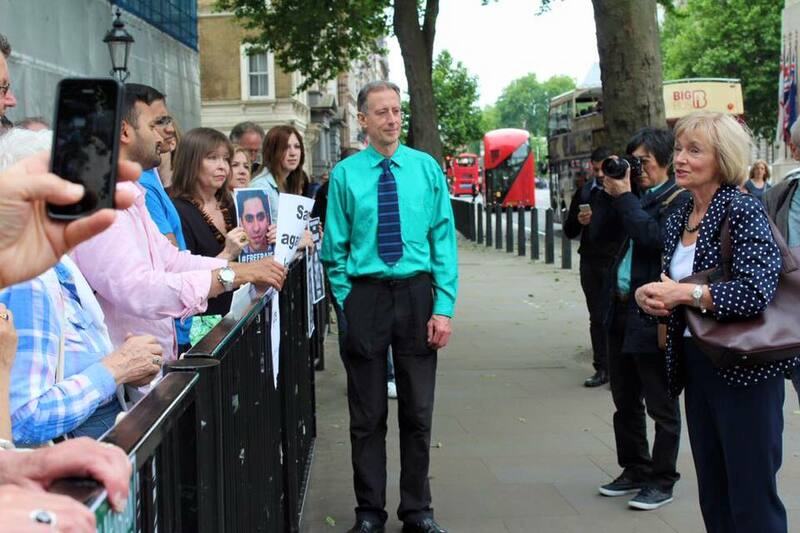 And thanks to the other 40 supporters of Raif, Waleed and others prisoners of conscience who joined us outside Parliament and to whom Glenys Kinnock spoke afterwards. Glenys Kinnock addressed some of the supporters who turned up at Downing Street. We held a successful public meeting later in Parliament with speakers as advertised but with Sarah Champion at the last minute stepping in to speak on behalf of Labour MPs support for the letter. Representatives of most of the organisations involved in the day, English PEN, Index on Censorship, Jimmy Wales Foundation, Free Raif UK, Campaign Against the Arms Trade met during the day and put a number of proposals to the meeting. We will write these up soon but the important and urgent one is what we can do stop further lashing of Raif. We agreed that if Raif is flogged again we would organise the largest protest we can on the following day, Saturday outside the Saudi Embassy.